yesterday i had to fix an error in a large VB file (> 8.000 LOC, Visual Studio 2008). With R# turned on it was nearly impossible to navigate in code with the cursor keys. Sometimes it takes more than 5 seconds after a keystroke after the cursor reacts, specially if you use the automatic repeat by holding down the key. While navigating the cpu load for VS was nearly 100%. Additionaly to the size of the file there are many code issues for which R# have to generate hints and warnings. Also intellisense was nearly unusable because it takes up to a minute until it appears. Sometimes VS is frozen until intellisense pops up, sometimes i can break and continue editing. The performance was much better in former builds and decreased significant in 2155.
the instructions at http://tinyurl.com/6xgxpw5) and upload them to ftp://ftp.intellij.net/.uploads/? pops up, sometimes i can break and continue editing. Yes! I'm not the only one with these problems!! i just made some snapshots but i can't upload them from my customer because the firewall block FTP. I will upload them this evening when i'm back home.When i look at the hot spots most time was spent in WaitHandle.WaitOne which seems to indicate threading problems. What i have also noticed, because VS was much slower than normal is, that if you press <Enter> in the editor to add a new line a "Dim" is inserted at the start of line and immediately deleted. When i enter a hyphen (') to start a comment, a bunch of spaces is inserted in the line. As i have configured the editor to use leading tabs, the leading spaces where replaced by tabs when i go to another line, but mostly some trailing spaces where leaved. wait for a task to run, so they should't affect the performance of the editor. Please let me know when the snapshots are uploaded, and I'll look at them. with 'Dim' and trailing spaces? WaitHandle.WaitOne which seems to indicate threading problems. some trailing spaces where leaved. i hav just uploaded the performance snapshots as LUEDIS_PERFORMANCE.7z. Inside you will find four snapshots. The names describe what i have done while taking them. Hope you will find issues, if not let me know and i will take more snapshots. issues, if not let me know and i will take more snapshots. I am also having extremely poor performance using R# in large VB files. I just upgraded to version 6 and it as bad or worse than 5.1 was. I disabled analysis of my two larger VB files so that I can actually edit, but thing still run slower than is comfortable. At this point, R# is almost useless in VB code. I reported this issue (again) for version 5.1 a few months ago and was told that the problem was known and should be solved in V6. Wrong! This has been an issue for years and I was able to simply download and install the C#-only version previously. It appears now that there is only one version with the VB features enabled depending upon your license key so now I cannot turn it completely off for VB. I have also sent two messages to support asking for help and have yet to get any response. I'm not impressed! I think I may have to consider dropping R# altogether as it just has too many problems and low support. i can't say R# 6 is unusable on large files, but i notice significant delays (> 15 seconds) when R# opens intellisense popup. Another thing is, that my CPU load is most time at 50% (on a dual core machine) and my harddisk is always working. I guess that R#'s code analysis conflicts with VB editor code analysis. code analysis while working with those files? Thank you! point, R# is almost useless in VB code. told that the problem was known and should be solved in V6. Wrong! license key so now I cannot turn it completely off for VB. actual i won't miss R# features ;). So disabling it for VB would be the last thing i would do. Generally the most annoying problem is the delay when opening intellisense popups and scrolling with the keyboard on large files, specially if there are many syntax errors in the file. I have another thread in the communit forum (see http://devnet.jetbrains.net/thread/307990). 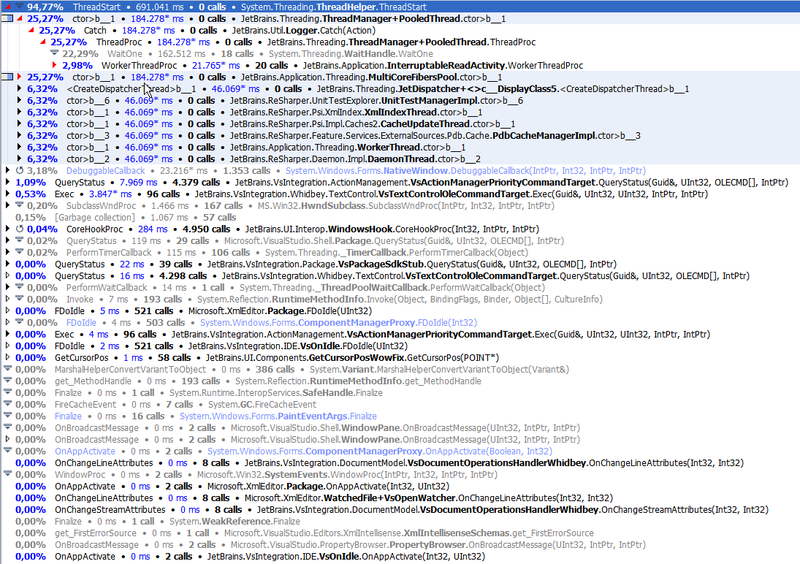 For this i have posted a dotTrace snapshot yesterday which hopefully addresses these problems. Sorry for the delay, but your email was trapped as spam. The two main files that I edit in VB are 750K and 960K, both mostly code. When I attempt to edit in these files, everything slows to a crawl. For instance, when I attempt to type the characters take a few seconds to even show on the screen. If I try to scroll the screen every just hangs for many seconds. This is how it works using the new version 6. It was so terrible that I had to uninstall it and reinstall version 5.1. At least this allow me to work although there are some annoying delays. In fact, I have had issues with VB for all the years I have used R#. A few months back I complained about version 5.1 and was told that the problem was known and would be fixed in version 6. So, I am greatly disappointed that not only is the problem not fixed in V6, but it is basically unusable. No, I have not tried switching back to VS Intellisense yet, but I did have to turn off code analysis for these large files. My main and largest project is certainly a challenge for R# and I do not even have the whole solution analysis enabled as that is too demanding on my system and slows everything. With R# disabled or uninstalled VS2008 is very responsive and gives no problems (but I miss R#!). FYI, I am using Dell Optiplex 755 running Windows 7 32-bit with 4GB of memory. If there is anything I can run or do to help you profile what is going on with R# please let me know. For now, I must continue using v5.1 until a solution is found.